Laryngeal sensory neuropathy (LSN) is a recently described condition felt to cause a chronic cough in patients when treatment for everything else (allergies, asthma, reflux, etc) has been evaluated and managed. Treatment for this condition is with neuropathic medications including neurontin, elavil, lyrica, nortriptyline, etc. In the past few months, I have seen a few patients referred to me with chronic cough treated with these medications with minimal or no improvement. OR... the cough initially improved with such medications, but than over time, stopped working. All these patients reportedly had a full workup with everything being normal and as such, was diagnosed with LSN. These patients were being solely treated with neuropathic medications and nothing else. WRONG!!! Treatment for both should have continued and very aggressively. Why? Patients need to keep in mind that it is not unusual that a patient may have SEVERAL factors of cough as well, ALL of which need to be treated in order to resolve a persistent cough. Because laryngeal sensory neuropathy results in a hypersensitized larynx, problems with reflux and allergies which ordinarily would not cause a cough (or any other symptoms) in normal patients, will now cause a persistent cough. (This situation is even applicable in patients who have NEVER had any symptoms of allergies and reflux in the past.) In other words, though allergy testing may reveal only mild allergies and 24 hour pH study may show reflux episodes within normal range, these "mild" problems now need to be treated aggressively along with the neuropathy. To reiterate... laryngeal sensory neuropathy is a hypersensitized larynx. 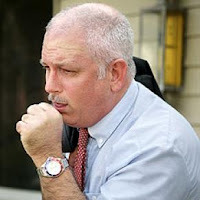 In this hypersensitized state, even a little bit of reflux or allergies will trigger a cough which normally would not. Each and every one of these conditions need to be treated aggressively to cure a persistent chronic cough. The lack of treatment for each and every known cause of cough (even if mild) is the most common reason why treatment of laryngeal sensory neuropathy fails with neuropathic medication. Middle-aged patient who has had a chronic cough for about 15 years. Had a full workup done and found to have mild allergies to only alternaria mold (class 1) and dust (class 2). He did not respond to allergy medications and so these meds were stopped. Reflux workup did show significant reflux and so underwent nissen fundoplication which did help the cough by about 30%. His doctor than diagnosed him with LSN and tried him on a variety of neuropathic medication with some, but incomplete improvement. I was than asked to help figure things out. The first thing I did was to instruct the patient to continue with the neuropathic medication that seemed to work the best for him (elavil 50mg twice a day). I also started the patient on allergy shots as well as an antihistamine and steroid nasal spray. I repeated a 24 hour pH and impedance testing to see if there was STILL reflux going on in spite of the reflux surgery. Lo and behold, there WAS both acid and non-acid reflux occurring, but on the high end of normal (much better than before his surgery). Based on this result, I restarted him on reflux medications daily. Within 3 months, his cough completely resolved. I slowly tapered the elavil off. Once we both were convinced that his LSN was cured, the daily reflux medication was stopped and used only as needed. Allergy shots could have been stopped as well, but patient elected to continue them, but he no longer needed the daily allergy medications. This patient apparently had allergies, reflux, and laryngeal sensory neuropathy causing his cough. Given he was being treated for only LSN prior to seeing me, that was why he had incomplete improvement of his cough. I aggressively treated for all 3 factors of his cough. The mild allergies and reflux were brought under tight control preventing them from constantly (even if mildly) irritating his hypersensitized voicebox. Once his voicebox was in an "clean" environment, it was able to heal and desensitize with elavil. Once the voicebox was returned to a normal state, the reflux and allergy was now able to be treated like any other normal person. The key thing to remember is that patients with LSN belong to a totally different sub-population of patients with a cough. One can NOT treat them as if they are part of the normal population. "Normal ranges" of reflux and allergies do not apply which actually makes sense if one realizes the voicebox in patients with LSN is hypersensitized. In another similar case, the patient did respond completely to gabapentin with 100% resolution of a chronic cough that was going on for 10+ years. However, after 6 months of being on this medication, the chronic cough slowly started to come back. In this situation, it was ultimately found that he had reflux that was untreated and was responsible for causing persistent nerve irritation exacerbating the neuropathy. The neuropathy was successfully treated with gabapentin, but because of the reflux, the effectiveness of this drug eventually wore off. Successful treatment of this patient's chronic cough required complete control of the reflux first followed by neuropathy medications. What if EVERYTHING truly did come back normal? There are a few things I've done in this situation where there's absolutely no evidence for any abnormalities on any testing, mild or otherwise. • Botox injections to the thyroarytenoid muscle of the voicebox (similarly for spasmodic dysphonia treatment). • Starting combo therapy using two different neuropathic medications, each of which seemed to help singly. • Capsaicin throat spray which appears to desensitize the hypersensitized nerve. • Trial knocking out the superior laryngeal nerve documented to be abnormal on SELSAP with a local 0.025% marcaine injection. If there's a good response with minimal side effects, consider surgically cutting this nerve. To read more about chronic cough due to LSN, click here. I was diagnosed with LSN a few months ago (after reading about it on the internet). My cough has been a recurrent problem for about 40 years. Treatment with 100mg of amitriptyline once a day has stopped more than 95% of the cough symptoms. Adding treatment for "allergies" or "reflux" would be ridiculous. My ENT also agrees with that. I've had multiple diagnoses over the past 40 years and one sinus surgery. The success of my current LSN treatment is definitely a life-altering success. But what if your cough returned to be as bad as BEFORE taking amitriptyline even though it may have helped initially? For those who experience this situation or the cough does NOT get better with amitriptyline, that's who this article is meant for. Your particular situation is probably purely due to LSN without other issues. As such, stating treatment for allergies or reflux is ridiculous is unwarranted. For 40 years, I have had a cough that starts and will not end for weeks, months or longer. I've seen at least 12 ENT's and other doctors to get an answer into what caused my cough. A couple months ago, I managed to stop the cough by almost 100%. How? The past few years the cough has been mild compared to other periods in the past 40 years. I have bad sacroiliac joints and had been prescribed 50mg of amitriptyline to help with nerve pain and to help with sleep. I had my sacroiliac joints fused a couple years ago and decided to ween myself off the amitriptyline in the spring of 2013. At the same time, the persistent cough returned with a horrifying vengeance. All of this summer was spent coughing and not feeling well. Reading through the years of comments on this page brought me to an undeniable cause of my cough: laryngeal sensory neuropathy. It had never occurred to me that the cough had been somewhat controlled by the amitriptyline I'd been taking for several years. I still had some amitriptyline pills and a refill, so I started to experiment with increasing the dosage beyond 50mg. 75mg worked better to control the cough, and 100mg worked even better. I actually had just seen an ENT a week or two before discovering the cause of my cough. So I wrote him a letter explaining that I had found a solution to my cough and made a new appointment. He agreed that laryngeal sensory neuropathy was a correct diagnosis and was happy to prescribe 100mg of amitriptyline per day. I'm 51 years old and have spent thousands and thousands of dollars on doctors, medications, tests and sinus surgery for my cough. But those days are over now. I'm thrilled not to cough or to fear the next recurrence of the dreaded cough that wouldn't go away. For me, the irritation was only on one side of my throat. The amitriptyline does cause an irritating dry mouth at 100mg a day. The ENT did say that I could ween myself off the amitriptyline until the next time the cough started again. I'm absolutely THRILLED to live life without the horrible cough, so I'm also a bit reluctant to stop taking the amitriptyline. I read some comments on this thread from people expressing a reluctance to take an anti-depressant for the cough. It's necessary to understand that medications like amitriptyline are used for other purposes. For me, amitriptyline has been used to treat nerve pain (sciatica) and for my laryngeal sensory neuropathy. I could care less what the purpose of amitriptyline happens to be, because IT WORKS. My cough is gone! I am an otherwise very healthy 38 year old male that has been suffering on and off from a diagnosed Sensory Laryngeal Neuropathy. It came about because of a freak accident 1 year ago when a cold pill was stuck in my throat for several hours. Ever since, I get a stabbing globus sensation right in the area where my adam's apple lies. I only cough when the globus sensation is very pronounced such as after drinking coffee or eating spicy foods. Initially,my globus was so severe that I could not work for 3 months (I am a technical Instructor). The greatest discomfort was insatiable gag reflex. I had to lie down most of the time to get relief. I took 2400 mg of Gabapentin for 2 months but could not tolerate the side effects. I was about to begin my Elavil treatment but instead decided that TIME would be the best medicine. Then magically, after 6 months, it went away (Only for me to acquire a Perilymphatic Fistula that still persists today.... I continue to believe that some how both ailments are somehow related....via the VAGUS nerve or reaction to extreme stress perhaps!) I was free from globus for about 6 months...then about 3 weeks ago. It came back! Why did it come back? I would assume the hyper sensitized laryngeal nerve heals in a linear fashion incrementally getting better. I am perplexed as to why it returned. Any thoughts? Suggestions? Can you recommend any skilled practitioners in the Detroit area as knowledgeable as you or more in this matter who will take this seriously and understand the nuances of LPR,NA Reflux, and LSN. I have never heard any of my doctors, dentists, or specialists mention LSN or NA reflux EVER and I seriously want to fix my physically declining and psychologically defeating chest and voice issues which sound extremely similar to everything you are saying here. Albutorol doesn't work. Prilosec helped for a while, but seems to be less and less effective years later to the point of pointlessness. And ceterizine doesn't do much of anything. Is there a word to define this specific type of ENT who focuses on such issues? If not, why has it never been mentioned to me that it could be a nerve issue? I was recently diagnosed with LPR and have had a persistent cough for 4 months. I was put on Nexium for 3 months and have changed my diet, but so far I have had no relief from this horrible cough. My next step is to look into LSN. The ENT Dr. I went to told me my cough was caused by reflux, but said he saw no damage to my throat. I have been very frustrated and not had much help with getting better or a treatment. Like the poster from June 8, 2014, I am looking for someone in Michigan who can help me with my LSN. I will go anywhere in Michigan! I am in the Grand Rapids area but cannot find a doctor to help. I do have allergies and LPR, and saw Dr. Jamie Kaufman in NYC 5 years ago where I learned I have LPR and post-viral vagal neuropathy, but I can't go back to NYC and I can't find anyone in my area who can/will help. I have seen ENTs and GI docs but the idea of LSN keeps getting poo poo-ed. I am currently coughing non-stop - like every few seconds - and it has shut my life down. Ugh. Thank you. If you can't find an ENT or a GI doc who is willing to think outside of the box, you might want to see a psychiatrist. (No, I'm not saying that you're crazy.) Elavil is also used to treat anxiety. In fact, that's its main purpose. You might have better luck getting a psychiatrist to write you an Rx for Elavil, if you're getting dismissed by the ENT and GI docs. Desperate times call for desperate measures. has anyone had episodes that resolve of neuropathic cough? ive had six that lasted months but this one is more intense. started elavil. anyone cured by it? anyone had the cough go away? or at least cured by elavil? Yes, Elavil (25-50mg depending on severity of cough; also, I always take generic Elavil...amitriptyline) always tends to get rid of my neuropathic cough within 1-2 weeks. I go off the amitriptyline after a couple months. Usually the cough will stay away for a few weeks or months after I quit the amitrip, and then I'll have to resume it. For me, it does not "cure" the cough..meaning the cough will return eventually once I stop the amitrip. If I were to stay on the amitrip indefinitely it would keep the cough from returning. I just like to take a break from amitrip because of the side effects it causes for me. I imagine it can "cure" some people if they've been on it long enough, maybe by calming the vagus or laryngeal nerves (I'm not a doctor, just guessing), but for me the nerve seems to be so sensitive and irritated that it may always be a problem for me if I'm not on amitrip. I hope the Elavil gave you relief- I know how incredibly frustrating this type of cough can be. Looking for a doctor in Ontario (preferably near Ottawa) that would treat LSN a.k.a. PVVN a.k.a. SNC in the ways that Drs. Kaufman (NYC) Chang (Virginia) and Bastian (Chicago) treat it... ie with amitryptaline or gabapentin trials. I Am too. did you have any luck, Cougher? I don't know if this information will be of use to anybody... My wife after suffering from chronic cough for 8 years and many many doctors (and drugs) who were all apparently ignorant of LSN had lacrimal tear duct drain plugs made of collagen inserted into her tear ducts drains by an eye doctor for the treatment of her chronic cough-The effect was instantaneous-her cough was cured!! !-or so we thought... So she proceeded a few days later after the collagen plugs dissolved to have the recommended more permanent laser surgery done to her tear duct drains. Worked wonderfully for about three weeks and then the cough gradually returned as bad as ever and now her eyes are constantly watery.... Though I am no Doctor I would see no harm in having "removable" lacrimal plugs installed for anybody just looking for some much needed possible temporary relief as it was quite dramatic in my wife's case. Or possibly of use for doctors in a diagnosis of LSN? Lastly, Just last week she had an ear nose and throat doctor tell her that there is nothing wrong with her and maybe she should see a psychiatrist as she may have had some underlying childhood trauma that was the likely cause!!! HA!